Los Angeles Times reporter John M. Glionna traveled to Colorado in 2015 to interview Izidor Ruckel. The meeting reunited Glionna and Ruckel for the first time since 1991. Glionna's first story covered Ruckel's transition into his new adoptive family after arriving in America at age eleven. What is Ruckel's life like now, almost 25 years later? 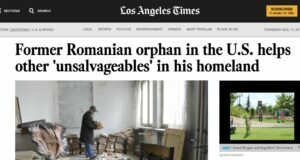 Click here to read Glionna's latest story: "Former Romanian orphan in the U.S. helps other 'unsalvageables' in his homeland"
I’m a Romanian social worker who use to work for a British NGO (CCFGB), that worked with children from Bihor county orphanages. I am now in Australia working still as a social worker. I know what you’re talking about when you talk about your life in the orphanage. It improved a lot after 1994 when I started to work but there were still not a good place for a child. I am impressed with your determination to advocate for the orphans. Good luck!